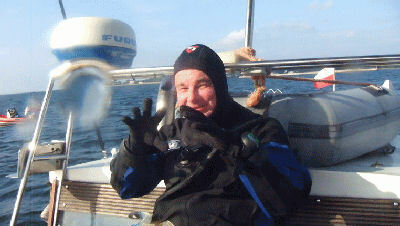 Psycho Solo Diver – Online Diving Blog and more!Narced | Psycho Solo Diver - Online Diving Blog and more! You are currently browsing the archives for the Narced category. 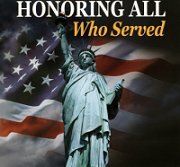 Thank you to all the Veterans that have served, and are serving, the armed forces of this country, to preserve the precious freedoms we still have left. Having to work today, and being so broke that I would have had to miss the Disabled Veterans’ Charity Dive trip regardless, Instructor John, Instructor Ron and I headed out in the mighty zodiac – now to be forever referred to as “The Red October” – to liberate more lobsters. I met two commercial lobstermen in the parking lot of King Harbor. Great, that’s who’s getting them! Riding over light wind chop, we made it to our secret area fairly quickly. There was no full moon; if the moon was out at all, it was behind the clouds. Hoop netters were in our last spot – maybe someone actually cracked my secret location algorithm? We went further South and anchored in 60 feet of water. I submerged off the boat and saw the ocean floor at 45 feet – where did the other 15 feet go? I went South, staying between 45 and 60 feet – the water was sort of chilly at depth, so I had to pee in my wetsuit to warm up a bit. I don’t know what it was, but I started to feel sort of narced for the first five minutes or so. 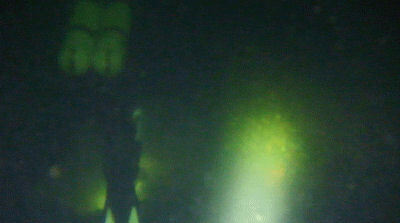 Visibility was better near the surface; the bottom was a little silty. I moved slowly, panning my light from side to side – my lobster senses knew there were bugs nearby. 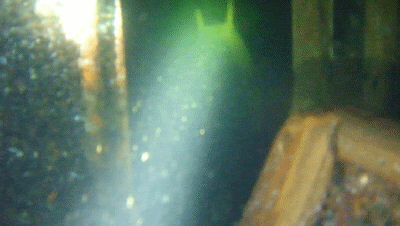 Five minutes into the dive, I pinned my first bug in 55 feet – it was legal by a few millimeters. 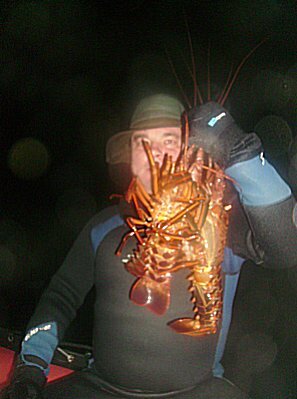 As a dive progresses and you don’t see any lobsters, even the puniest bugs may look like monsters; so grabbing a legal one right off is a good sign – now my frame of reference was geared towards legal bugs only. There was a slight current going South and some strong surge in various places; coupled with the silty visibility, I wasn’t able to cover as much ground as I wanted. Roaming a reef at about 50 feet, I spotted a junior monster out in the open – it backed up, preparing to flee when my light hit. I held my light at arm’s length, backed the beam off and kept the bug’s silhouette in view. It started to back up, but I was already behind it for the pin – Bam! Another bug has been liberated! I shook my first one down the bag and put the second one in – the thing was like pinning a Foster’s beer can, so there was no need to measure. Not more than 10 yards away, I caught my third bug for the night – my bag was getting heavy. 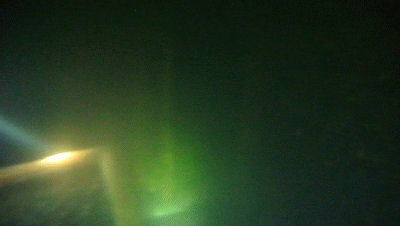 I started heading back to the boat at 1200 psi. I made a pledge to myself to start making my way to the surface at 600 psi and not look at the floor while coming up. It’s a ruse used by the lobster gods to kill SCUBA divers – I was almost a victim a few seasons back. When a big lobster sees a diver start surfacing from 60 feet or deeper, the lobster assumes that he’s probably almost out of air – maybe down to 500 psi. 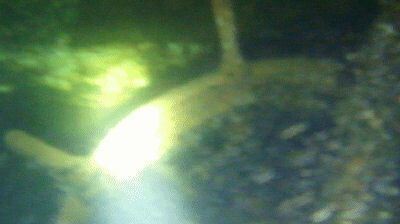 The big lobster will come out and start walking around under the diver, who is heading up. When the diver sees his chance for one last easy lobster, he usually postpones his ascent and chases after the bug. Once pinned, the bug puts up a good fight – grabbing the bag closed, grabbing the diver’s mouth piece, biting the diver’s fingers, if he can. 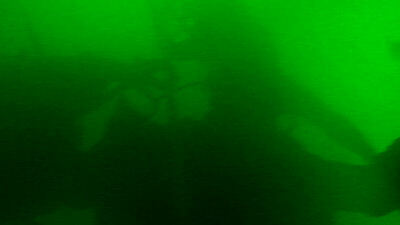 At 60 feet or deeper, 500 psi can go REALLY quickly when fighting a monster lobster. 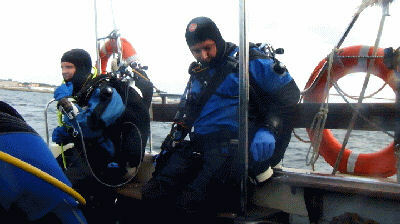 Suddenly, it’s awfully hard for the diver to breathe – he looks at his air gauge, and he’s out! 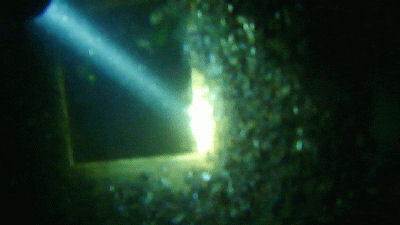 Panicked, the diver drops his lobster bag and weight belt and bolts to the surface. Shooting to the surface from 60 feet or deeper, he could have an air embolism, a heart attack, get the bends or, if he holds his breath to the surface, have his lungs explode. That is how the lobster gods fight the lobster liberators – don’t let that happen to you! Don’t become lobster food – when lobsters eat human flesh, I hear it makes their tail meat taste really strange. I’m really not that fat – I think the weight of all that lobster gave me a hernia. Instructor Ron caught one bug, Instructor John got skunked. They had gone the opposite direction, instead of following an expert lobster hunter like myself. 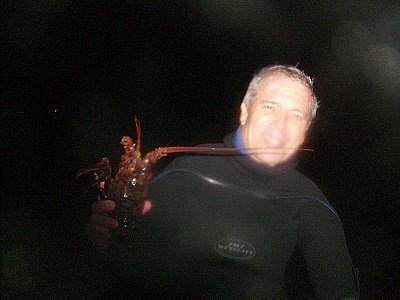 The next lobster hunt is scheduled for next week in a significantly deeper spot.